The crew, cleared for a runway 04 ILS approach, became uncertain of their position. The aircraft struck the southwest face of Hall Mountain at an elevation of 2,400 feet. Radio equipment installed on the aircraft was non standard (and non FAA approved). The ADF and 2 NAV displays were in an unsuitable location for the first-officer. 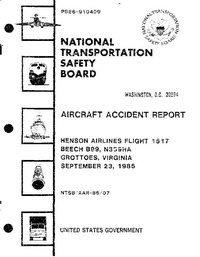 The National Transportation Safety Board determines that the probable cause of this accident was a navigational error by the flightcrew resulting from their use of the incorrect navigational facility and their failure to adequately monitor the flight instruments. - and stress-inducing events in the lives of the pilots. Also contributing to the accident was the inadequate surveillance of the airline by the Federal Aviation Administration which failed to detect the deficiencies which led to the accident. Distance from Baltimore/Washington International Airport, MD to Staunton-Shenandoah Valley Airport, VA as the crow flies is 217 km (135 miles).